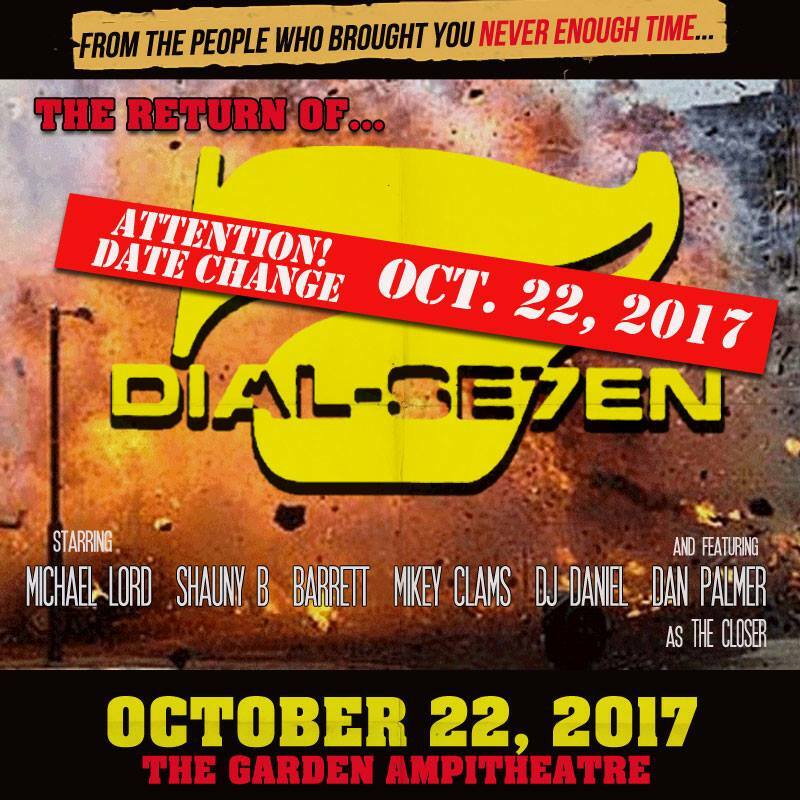 Dial-7 is Live for One Nite Only!!! 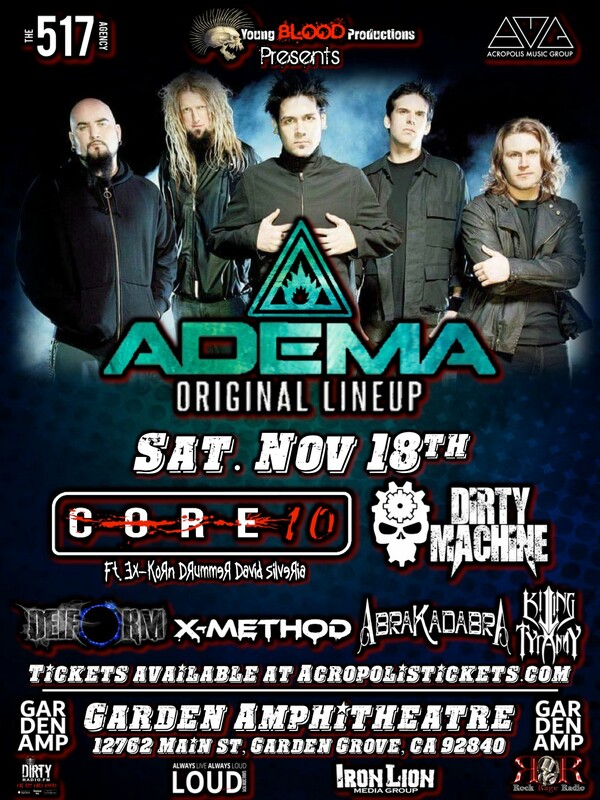 This will be their 1st show in 13 years! Something you definitely don’t want to miss out on! or No Ticket Fees at Programme Skate & Sound in Fullerton. Motograter was formed in 1995 and is most well known for their namesake instrument the “Motograter”, a mysterious contraption designed with industrial cable, guitar pieces, and other components, to create a unique, low, distorted bass sound. The band is widely known for their image, notorious for covering themselves in tribal style body paint. The early stages of the group’s career consisted of heavy experimentation with industrial sounds, samples, and tribal drums. The band released two EP’s ‘Hugh Chardon’ and ‘Indy’ and in 2001 were signed to Sever Records, founded by Dez Fafara of Coal Chamber. The band’s sound continued to evolve, eventually incorporating a dark, groove-oriented guitar styling, that would help broaden the band’s appeal and reach a wider audience. In 2003, the band inked a deal with No Name/Elektra Records and released the highly acclaimed. self-titled album, ‘Motograter’, featuring Ivan Moody (Five Finger Death Punch/Ghost Machine) on vocals. The song “Suffocate” was featured on the soundtrack to the film The Texas Chainsaw Massacre. The song “Down” is featured on the EA Sports video game Nascar Thunder 2004. Motograter toured on Ozzfest 2003. 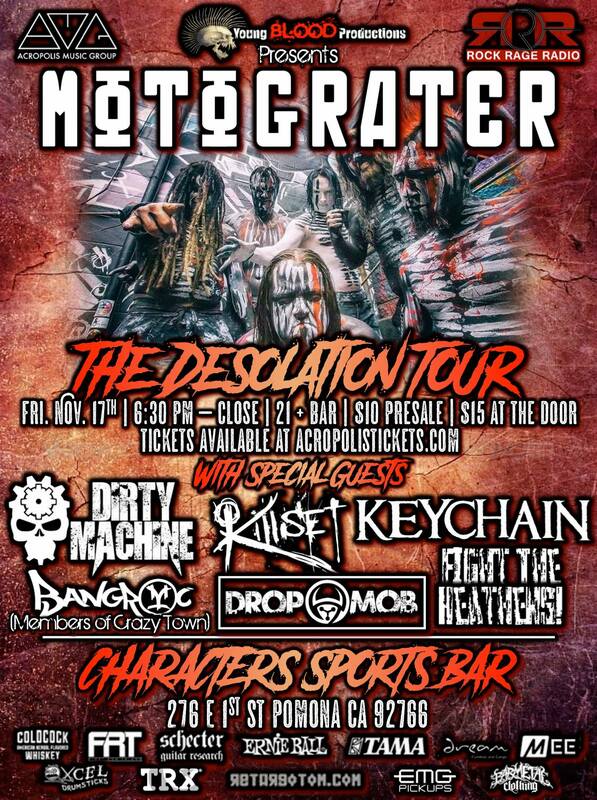 Motograter has toured with Ozzy Osbourne, Korn, Marilyn Manson, Chevelle, Disturbed, Ministry, Nothingface, Kittie, Mushroomhead, Cradle of Filth, Killswitch Engage, Chimaira, Shadows Fall, Voivod, and much more. COMING 2017! EMP Label Group will release ‘Desolation’, Motograter’s highly-anticipated sophomore album, produced by Ahrue Luster (Ill Nino/Ex-Machine Head) and mixed by Joshua Wickman (Within the Ruins, KING 810). The album was engineered by Luster, Wickman, and Jon Berrier, and recorded atIllustrious Productions, Dreadcore Productions, and BlackPlate Productions. Desolation marks the band’s first full-length album since the 2003 Elektra/No Name self-titled release featuring Ivan Moody (Five Finger Death Punch) on vocals (Motograter is now fronted by James Anthony Legion (Deadform/The Breathing Process), and signing to EMP LABEL GROUP has brought that excitement full circle, according to label operations manager/A&R Director Thöm Häzäert. “I was actually in (the late) Steve Richards (No Name Records) office the DAY he signed Motograter. And he was SO excited, going on and on about this amazing new band he just signed, that made their own instrument (The Motograter) etc.. Steve was such a cool and infectious guy, and brought such an amazing energy to everything he did, and to this day, that stuck with me. Additionally, Motograter has signed an exclusive deal with JLS Artist Management. JLS is run by former Rock Ridge Music label president Jason Spiewak. Spiewak says “We are stoked to have this opportunity to work with Motograter. These guys are road dogs, ready to work hard and deliver a great record”.